"**It’s very important to do this with a wooden spoon, not a hand mixer." Any time you mix a cookie batter with a hand mixer (or stand mixer) you will get a flat cookie unless you add more flour. 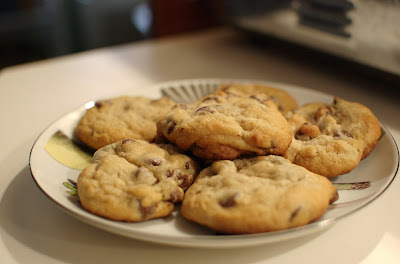 I usually add around 1/4 cup to the chocolate chip recipe and have no problems. To clarify, that's 1/4 cup to the entire recipe as it appears on the bag of chips. You'd use just a few tablespoons for this amount. I only like them crisp, in fact a med golden brown with a brown, not burnt, taste. Will the toaster oven not make crisp cookies? I'll try this one... Thanks!!!! I made this,but it rises a lot and has a cake like consistency.But is is quite nice.For my toaster oven,10 mins was too long and i burnt the first batch,6 mins was enough.SO 1 tip from me is that keep your eye on the cookies to make sure it does not burnt. Hi Anon, thanks for trying out the recipe. You're right, the cookies do have more of a cake-like consistency and are definitely not crispy, but they are just the way I like them. Also, it's difficult to gauge toaster ovens. It's important to know your own and to always watch the oven when you're trying out a recipe for the first time - even in a full sized oven! Thank you for the recipe; my big oven is broken so I'm restricted to the toaster oven. These are indeed very cake-like but delicious with a glass of milk. It only made 12 cookies for me (2 batches) but maybe I was just too generous with the batter. Also, it took about 15 minutes. I also added chopped walnuts... very tasty. 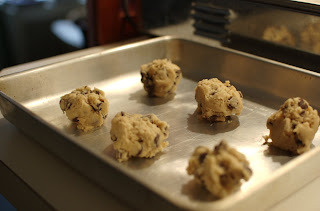 I'm about to bake these for my hubby and his work buddies, we don't have an oven so I'm super excited to see how they turn out:) I love cakey cookies! Is this possible if I use turbo? I didn't have any butter so used Banana instead, also used white sugar with a dollop of honey. Very cakey but still crunchy on the outside. Delicious! How much is a stick of butter? Can I use ordinary table salt instead of sea salt? And umm can I use self raising flour if I don't have baking soda? Sorry for all the qns don't really have lotsa stuff. A stick of butter is 8 tablespoons, table salt is fine, yes, and you can use self raising flour, but the ratio might be off because there is a certain amount of baking soda in it. Hi, I just would like to share my baking experience with toaster oven. One tip: you could use a foil underneath and on top of the cookie so just to prevent it from burning. I also suggest placing a foil underneath and grease it with butter. Mine turned out a bit crunchy. I even tried substituting olive oil instead of butter for greasing and turned out so crunchy! 15 minutes, but someone said that 6 mins was enough. Im a 14yo guy heh. He thanks for the recipe, I'm gonna try this... how do I make the cookes less cakey and more crunchy? Does anone know?